Why don’t owners improve their homes? 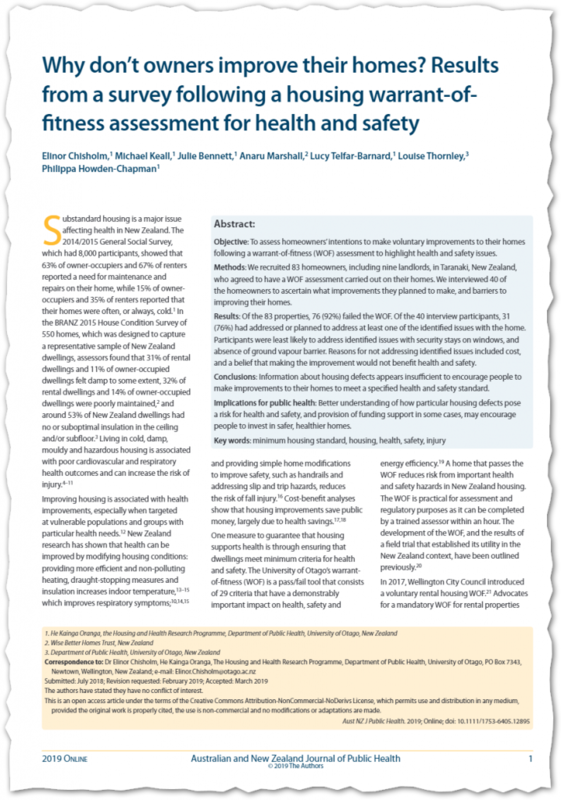 Results from a survey following a housing warrant‐of‐fitness assessment for health and safety | Sustainable Engineering Ltd.
Bottom line – even when folks know that their house is making them sick and the fix is easy/cheap they do not do so unless motivated by some other means. Even if it is making themselves and their kids sick. At first I want to freak out and throw up my hands at the hopelessness of this result but then I realise it is no different to how the public (me too) eat bad food or otherwise fail to take care of our health. We take it for granted until we don’t have it and even then we sometimes won’t eat healthy. It will take more than education to change unhealthy eating patterns and from this study it will take more to than just educating the public to have them fix our houses. Objective: To assess homeowners’ intentions to make voluntary improvements to their homes following a warrant‐of‐fitness (WOF) assessment to highlight health and safety issues. Methods: We recruited 83 homeowners, including nine landlords, in Taranaki, New Zealand, who agreed to have a WOF assessment carried out on their homes. We interviewed 40 of the homeowners to ascertain what improvements they planned to make, and barriers to improving their homes. Results: Of the 83 properties, 76 (92%) failed the WOF. Of the 40 interview participants, 31 (76%) had addressed or planned to address at least one of the identified issues with the home. Participants were least likely to address identified issues with security stays on windows, and absence of ground vapour barrier. Reasons for not addressing identified issues included cost, and a belief that making the improvement would not benefit health and safety. Conclusions: Information about housing defects appears insufficient to encourage people to make improvements to their homes to meet a specified health and safety standard. Implications for public health: Better understanding of how particular housing defects pose a risk for health and safety, and provision of funding support in some cases, may encourage people to invest in safer, healthier homes.